Capacity and design: This Wine Enthusiast 32-Bottle thermoelectric wine cooler looks demure and mysterious – with its reflective smoked glass door and silent operating state. This unit has black exterior top and sides. This model is energy-efficient, CFC-free and virtually vibration-free. This Wine Enthusiast unit has a moderate capacity of 32-bottle in two zones, i.e. two sixteen-bottle zones. You have options and flexibility to store both red and white wine in this cooler. This Wine Enthusiast model is slender and compact at 33 ½” tall and 15 ¾” wide. This model must be installed as a free-standing unit in an open area. Why? Because it uses thermoelectric-cooling system. You want to make sure there’s sufficient space for ventilation. Note: low ambient temperature surroundings below 75°F is required for this unit. Metal shelving: This Wine Enthusiast unit has 7 rolling metal with chrome shelves. You can store four bottles on each shelf – giving you a total of 32 bottles. Of course, your capacity will be less than thirty-two bottles when you keep large bottles like Champagne or magnum-size Sparkling wines on the shelves. 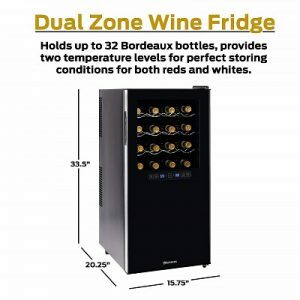 Temperature zones: The Wine Enthusiast 32-bottle has a dual-zone cooling system. The upper temperature zone can be set between 54°-66 °F. The lower zone has a range of 46°-66°F. Each temperature zone is independently controlled. 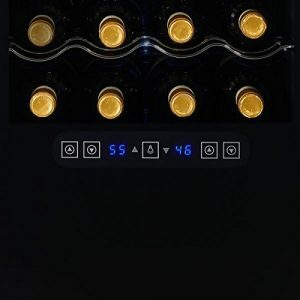 Digital touchscreen temperature control:This Wine Enthusiast 32-bottle features an exterior digital touchscreen with LED displays. This convenient feature allows you to monitor and easily set the preferred temperature for your wine collection without opening the door. Reflective smoked glass door: This Wine Enthusiast 32-bottle wine cooler features a dual-pane glass door. It is a reflective smoked glass door and UV tinted. Your wine collection is happier without being exposed to UV. Note: This right-hinged smoked glass door is not reversible. So, plan accordingly as to where best to house your Wine Enthusiast wine cooler. LED light: This Wine Enthusiast model has an interior soft-lit LED light. We recommend you not to leave the light on for a long period of time. Your thermoelectric unit does not like heat source. Security lock: This Wine Enthusiast unit does not have a lock. Summary: This Wine Enthusiast Silent 32-Bottle wine cooler (view on Amazon) is energy efficient and quiet. It is compact and elegant looking with smoked glass door. It is a dual-zone, suitable to store both red and white wines. It has a digital touchscreen temperature control. 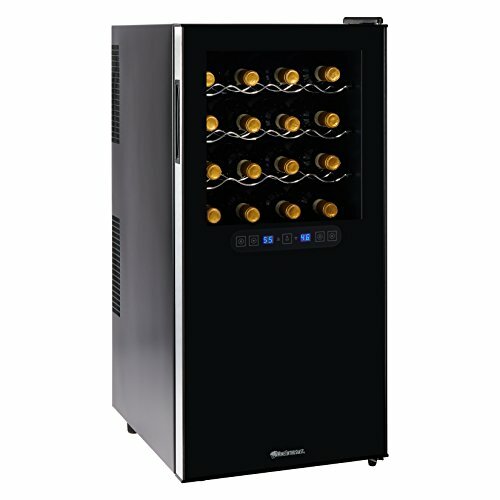 If you are looking for a moderate capacity thermoelectric wine cooler, consider this Wine Enthusiast Silent 32-Bottle on your evaluation list. If you would like to consider other 30-59 capacity models, check out our featured list of the moderate-capacity wine coolers.